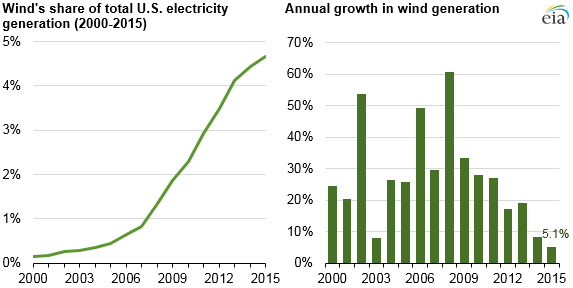 Wind energy produced 191 terawatthours (TWh) of electricity in 2015, accounting for 4.7% of net U.S. electric power generation, up from 4.4% in 2014. Wind was the second-largest source of electricity produced from renewable sources, behind hydroelectricity, and 11 states generated more than 10% of their total electricity generation from wind. Both the absolute amount of wind generation and wind's share of total U.S. electricity generation have risen every year since at least 1999. 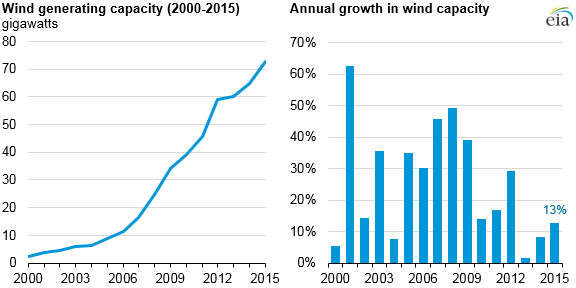 Wind capacity additions grew by 12.9% in 2015, an increase over the growth over the previous two years. In 2015, 8.1 gigawatts (GW) of wind capacity was installed, representing 41% of total capacity additions and bringing the total U.S. wind capacity to 73 GW. Capacity additions in 2013 were at their lowest point since 1998, when 0.9 GW were installed, due in part to expiring tax credits that have since been extended. Year-to-year changes in wind generation reflect both the changes in wind capacity and yearly variations in the wind resource. Wind resources reflect seasonal wind patterns, which vary based on regional factors and are subject to year-to-year climate variations. 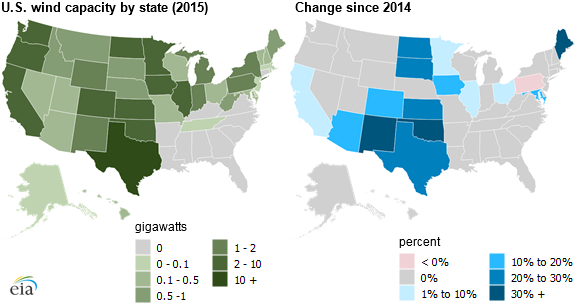 At the state level, three states in the Pacific Census division—California, Oregon, and Washington—saw decreases in wind generation in 2015, as did most of the states in the Mountain Census division. Meanwhile, all but 1 of the 12 states in the Midwest region saw increases in generation. Texas continues to be the nation's largest producer of wind energy. 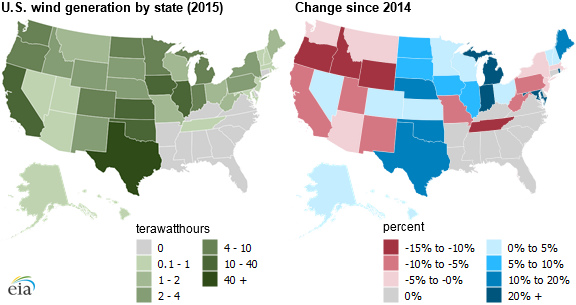 Texas accounted for 44% of all wind capacity additions in 2015; Oklahoma and Kansas, the states to its immediate north, made up another 25%. In 2015, 17.7 GW of installed wind capacity in Texas produced nearly 45 TWh, accounting for 24% of all U.S. wind power. Texas built a 3,600-mile transmission network that can connect wind-generated electricity from rural areas to urban load centers. That system and the strong winds on the Texas plains have helped enable the state's substantial wind generation. EIA's most recent Short-Term Energy Outlook projects that wind generation will increase 16% in 2016, as significant capacity additions are expected to come online, adding another 6 GW, or 9%, to operating wind capacity in 2015. Based on those capacity additions and the expected performance of wind turbines in each region, wind is projected to supply more than 5% of U.S. electricity generation in 2016.